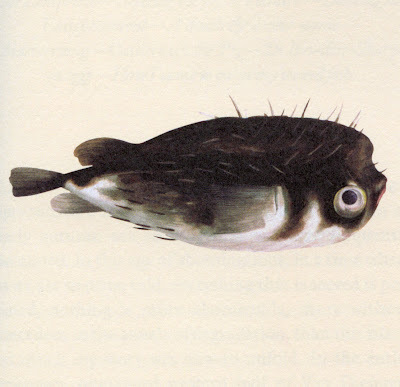 Porcupine fish by the convict artist William Buelow Gould. Scanned from 'Gould's Book of Fish' [buy]. I'm reading 'Gould's Book of Fish' (finally) and enjoying it, repulsed by it and am completely engrossed by it. Last night I was checking the publishing details and noticed that the book is set in the 'Historical Fell Types' the site of which has been recently re-designed. Type example from 'Gould's Book of Fish'. The Fell types are an excellent example of freely available (as long as you credit the author) fonts and are as irregular and as characteristic as the text they set in 'Gould's'. It's appropriate that 'Gould's Book of Fish' is a quasi-historical account set in historical fonts rendered and reproduced via digital technology. Note that these scans are from the hardcover edition which is printed in full-colour throughout (to excellent effect, capturing the various pigments and effluvia Gould uses to write each chapter) and the paperback version lacks this.